Fluffy Coconut Rice with Tofu Pillows. Kid-Approved. Coconut Cashew. This dish is simple, because I use rich flavors. 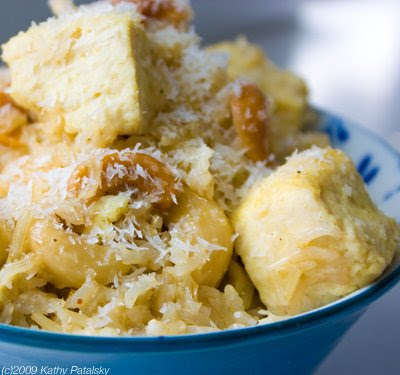 Crunchy-creamy cashews, coconut milk, shredded coconut, organic brown rice and vanilla rice milk are just a few of the flavors you'll find in this dish. 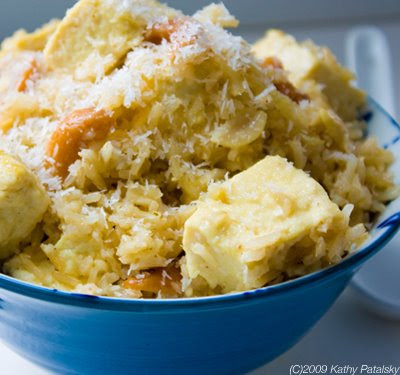 Add in some tofu pillows (flavored by absorbing the flavors of the rice) and you have a dish that is not only fluffy and comfy, but healthy! It's loaded with protein, fiber and vitamins. 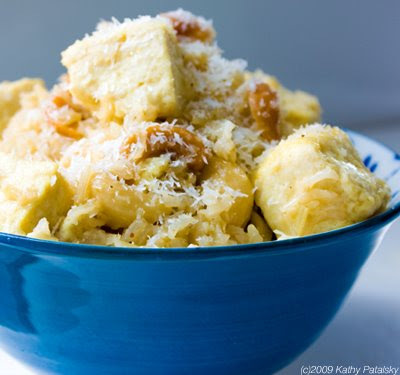 You can always make this dish lower in fat by substituting coconut milk for rice milk. But trust me, that creamy coconut milk adds a warm comfy flavor that I wouldn't dream of skipping. 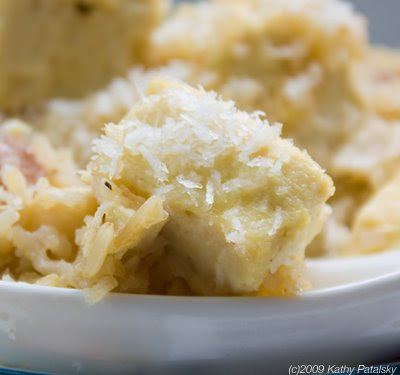 Even a few Tablespoons of coconut milk will bring the rice to life. Long Grain Brown Rice. I tried this dish with both long and short grain rice and I was surprised how much more I liked it with long grain brown rice. 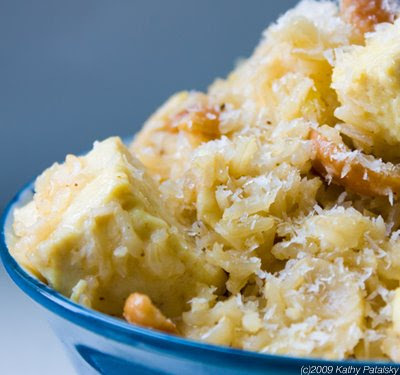 The stringy long texture of the rice complimented the choppy texture of the coconut flakes. You can also use long grain white rice, but the brown rice is a bit healthier. For more, read my post: Brown Rice: Super Food. White Rice: Not So Much. Kid Approved. For all the moms and dads out there. This dish will be a hit with kids. Call the tofu pillows, tofu marshmallows if you want. The sweetness and creamy coconut flavor is one kids can enjoy. To mild out the flavors use less seasonings if you'd like. Let your kids sprinkle the last pinch of coconut on top and they will be healthy happy eaters. Kid Add-in: Need more sweet flavor? Add in fresh pineapple chunks. I like them raw folded in, but you can also cook them in for a Teriyaki flavor. Call the dish a Luau Bowl! optional: 1/2 tsp vanilla extract for a more intense vanilla flavor. 1 tsp. grated fresh ginger. Add rice, coconut milk, water and rice milk/coconut beverage to soup pot. Add salt, cinnamon and powder seasonings. Bring to a boil, then cover and reduce to a simmer for about 15 minutes. Then fold in the agave syrup, vinegar, cashews, coconut flakes and optional vanilla extract. 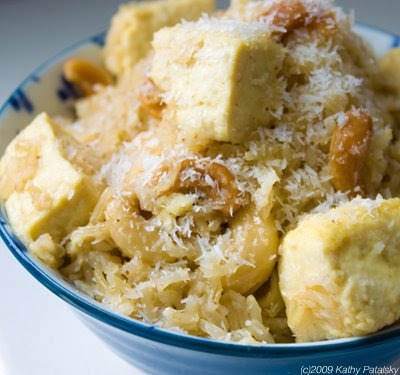 Add tofu cubes to top of rice-smooth them into the rice, but keep them on top to steam cook. Cover pot again with lid and allow rice to simmer for 5-10 minutes or until tofu is fluffy cooked through. Note: If the rice looks dried up at this point, add a 1/2 cup of coconut milk, or for a lighter version 1/2 cup of rice milk. Check on the dish in 5 minutes. Test a piece of tofu by slicing it in half. If the center is airy and fluffy, it is done. If it is still gritty or grainy, keep cooking. When dish is ready, gently fold the tofu into the rice. Also fold in 1 Tbsp of coconut oil (optional). Remove pot from heat, but let dish sit for 5 more minutes, covered. 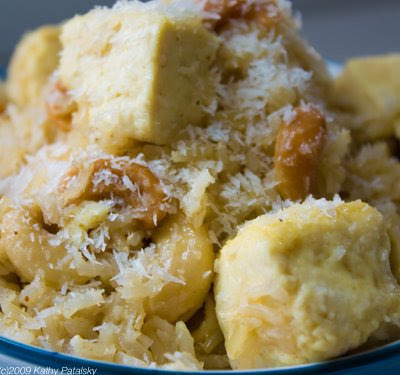 This will further marinate the tofu with all the creamy coconut rice flavors. Plating: Spoon rice into a bowl. Add a few large tofu pillows to the top layer. 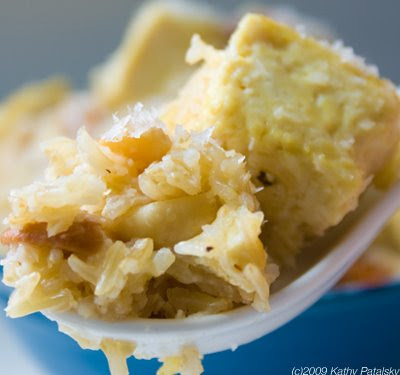 Sprinkle with shredded unsweetened coconut flakes. Another nice addition would be a fresh pinch of chopped basil or fresh grated ginger on top. I also like a bit of fresh ground black pepper.